On the 28th ‎of May ‎2017, we headed down to Legoland Windsor resort to try out their new Triotech dark ride for 2017. The new dark ride is located in a new area of the park called LEGO Ninjago World. The area features 2 attractions and many different types of interactive play areas. The main E-ticket attraction within the new land is the Lego Ninjago ride (which is an interactive dark ride) as well as the relocation and re-theme of the old longboat invader- now known as destiny’s bounty. Unfortunately, on our visit, this attraction was still under construction and not open to the public yet. The interactive play areas around Lego Ninjago world features a small climbing wall called Cole’s Rock Climb. There is also an area called Kai’s Spinner’s, Jay’s Lightning Drill and Zane’s Temple Build which is a Lego building area. Lego Ninjago the ride is a fantastic addition to the resort with many great features. Even before you board the ride the queue is an enjoyable experience. Why? Because unlike most of the other rides located at Legoland Windsor 80% of the queue is covered which is great for the unpredictable UK weather. There is also lots of fun interactive areas and models within the queue line to keep you entertained. The new dark ride is a 3D based screen shooter where you use your hand gestures to aim and shoot the targets on the screen. The ride also features some theming elements that are blended in with the screens by using projection mapping. Heat and smoke effects are also featured within the ride which adds up to a very fast and fun enjoyable attraction! At the end of the ride, you can view your on-ride photo of yourself with your score shown below! 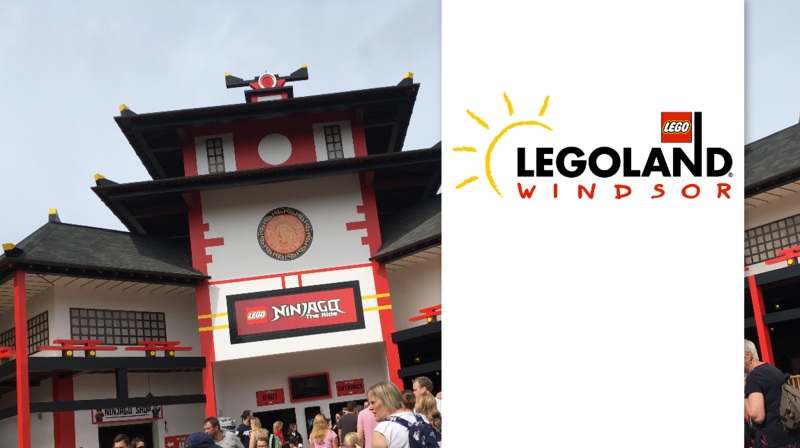 There is also plenty of Lego Ninjago merchandise to be offered at the end of the ride within the gift shop. We hope this is the start of many large scale attractions to come to the resort in the future. Here’s a video that we’ve produced of an on-ride POV of the new Lego Ninjago attraction. Next: Next post: A new LEGOLAND Discovery Centre will be opening in Birmingham for 2018!